I must admit that I only made one set of butterfly wings and my good friend Michael Ortiz made all the other ones. We were making these for his wife to take to school for her students. We didn't put much attention into the detail of making a body for the wings. Use a pattern of a butterfly. 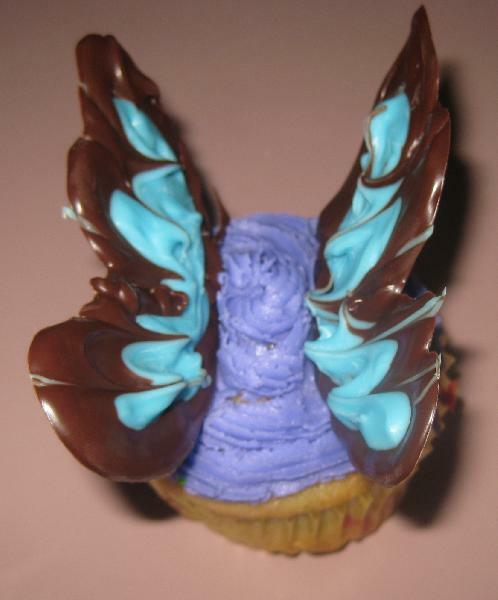 Outline the butterfly shape using the melted chocolate. Fill in with the outline with the other color. Use a toothpick to pull in the sides to create the design.